Nobody wants to think about it, but at some point in your life you may face a situation where your spouse ends up in the hospital. As awful and hard as this can be the thing that can truly complicate matters is if you have children to take care of; particularly young ones. My husband and I have faced this harsh reality more then we would like to admit and it never gets easier to handle. In fact the older we have become (because yes, 30 feels ancient to us) the harder it has become to have one of us in the hospital. Life tends to throw more on us as we become older and good health isn’t normally one of those things. This last hospital stay left me with the realization that I could have used some help navigating the situation and how I should handle it with a 3yr old and a 10 month old. 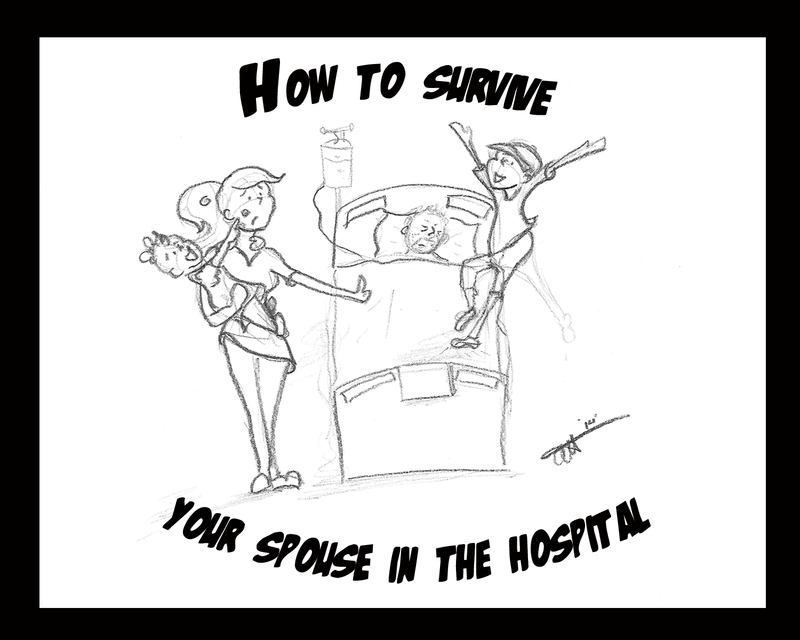 I decided that I would write some tips that might be of some use to other people who find themselves holding down the fort while their spouse is in the hospital. I know this seems obvious to anyone reading but I found I had to constantly remind myself of this step. I felt like I needed to accomplish everything I normally did and takeover what my husband could not tend to. Foolish I know, but it is an automatic and natural response for someone in this situation, especially one with small children. As a mom or dad you want to lessen the impact of this event on your children and have their lives remain as normal as possible. A few days into this last hospital stay and I realized this isn’t possible. Your children will notice something is wrong when their father goes mysteriously missing for days no matter what you do and no matter how much you take upon yourself; so in the long run it is better to prioritize and cut down. Focus on the important things like paying the mortgage on time, working out disability leave for your spouse if they are unable to, feeding yourself and the kids and forget about getting all that laundry done and cleaning your house until it shines. Your kids won’t mind, you will find everything easier to handle, and no one else will hold a dirty house against you. I don’t know why but I carried a huge amount of guilt around during all of this. I felt guilty that it wasn’t me in the hospital instead of my husband, guilty that I wasn’t there every moment of the day, guilty I couldn’t get everything done, guilty I couldn’t make him better, etc. No matter what I did I couldn’t forgive myself for things that I couldn’t control and weren’t my fault. Don’t be like me, realize this is not your fault, you can’t be there every second of the day (even the nurses wouldn’t allow it), you shouldn’t even try to get everything done and some times no matter how hard you try you can’t make someone better. I clearly forgot this step as evidenced by my 3 year old son hand feeding me cheerios one morning while saying “Eat Mom, eat.” It is so easy while worrying about someone else to forget that you have needs too, but you can’t function properly if you never sleep, eat, or shower. Once my son woke me up to this fact I followed Tip 4. I hate asking for help, like would rather walk through a thousand fires then ask for help I don’t know why but I do. This is stupid. Just do it and move on. You will find that more people are willing to help then you expect and there won’t be strings attached. I was lucky that both my parents and in-laws were around and super willing to take the kids for a bit each day and even a sleep over so I could take care of myself and take time to visit my husband. Okay this is the one I failed at the most. I handled this so poorly but I was stumped as to what I tell a 3 year old as to why his dad hadn’t been home for so long. It’s not that I didn’t think he would comprehend the situation but that I A) didn’t want to upset him and B) honestly couldn’t find the words! In the end I just didn’t really say anything, which is kind of awful. I think at one of the many times my son asked me “Where is Daddy?” I might have mumbled something like “Daddy doesn’t feel well, he is at the doctor…”. Since I am still at a loss on how to handle this I compiled some hints from around the internet from people who are better adjusted then me. -I told them all the time that Daddy missed them SO much! -I had them pick out a toy to send Daddy so he could sleep better. -Told my son that Dad would help him fix stuff and play with Lego’s when he got back so he knew he was coming back. I hope this might help someone else through a difficult time. These things won’t fix everything, but they might make it easier to navigate the situation. Having a spouse in the hospital is a unique situation; you suddenly get thrown into being a single parent without any warning and have all the difficulties of dealing with a hospital stay thrown on top of it. The only way through it is moment by moment because lets face it you simply don’t know what the next moment will bring. This last hospital stay was wrought with random tests, long stressful waiting periods for test results and surgery thrown in to boot; all after what was supposed to be a fairly routine visit with the family doctor. My last tip is: Don’t forget to breathe you will get yourself and your family through it somehow. Reblogged this on It's from A to Z.